Pont Noir • Surge protectors: touching wood? French LifeFrench Electrics	Surge protectors: touching wood? Virtdave doesn't trust surge protectors (see: Ending Livebox contract), and he has got a point. The standard surge protector is essentially a so called low-pass filter. Very simple. It tries to block all frequencies above the 50 Hz fundamental frequency of your 230 Volt powerline. Just like a filter in an audio amplifier - vinyl records - helps you in getting rid of those "clicks and pops". Although the remastering of the albums of the Beatles has been a bit more complicated. You throw in a handfull of cheap components: two inductors ( 2,5 mH to 10 mH) in series with live and neutral, two capacitors between live and and neutral (22 N to 470N), two capacitors from live and neutral to ground (4,7N to 10N) and a resistor (470K to 1 M) to discharge the first live/neutral capacitor to prevent a shocking feeling when removing the plug from your wall-socket. 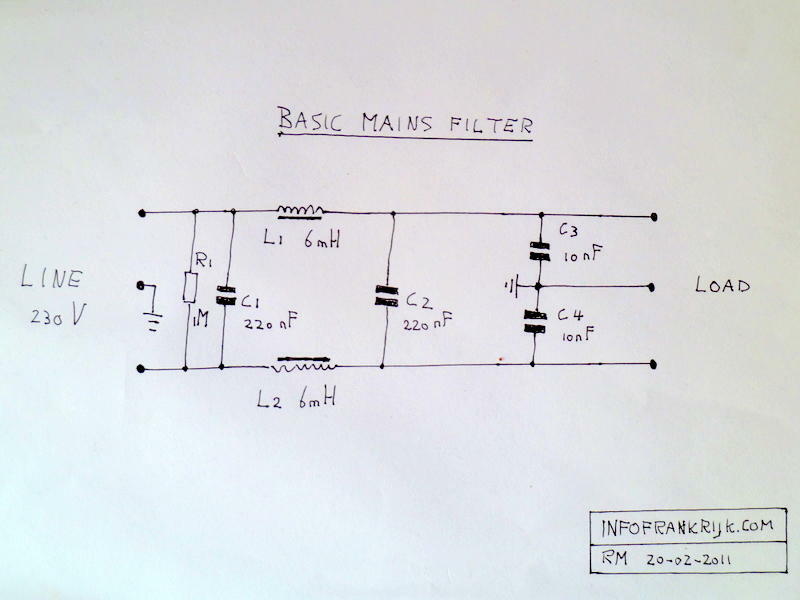 Last but not least: add one or three varistors (voltage dependent resistors, VDR). They will short transient voltages, and should in doing so save your equipment. But it is, from the producers perspective, a low cost solution, with a lot of paper promises. Thanks, PR departments everywhere, in convincing us so eloquently. They should take away the pain before it hurts our beloved ones, e.g. a brandnew laptop, but not always do. They simply are not fast enough to cope with the extremely fast "risetimes" of lightning induced overvoltages, spikes coming in from the local powergrid, or strange things happening underneath your feet when the lightning goes in nearby and groundvoltage doesn't equal zero anymore, and hits the ceiling. So they are relatively slow, and also age. Their performance declines gradually after absorbing minor and major hits. If the producer wants to do a better job, he adds a faster reacting TVD, a diode to suppress voltage spikes. The surgeprotectors for the telephoneline - another point of entry to flash your modem/pc/phone-system - are a voltage scaled down version of their 230 Volt brothers and sisters. With even less components: we don't want to see a capacitor shorting all the high frequency components of the incoming adsl signal, we want to have a signal level as high as possible. The more professional solutions are modules in the consumerbox, or very close to it. They have been designed to react extremely fast using special zener-diodes, or use a more conventional approach in combining varistors and e.g. some sort of spark gap (gas tube suppressor). So perhaps touching wood may help a surge protector to feel confident in its lonely fight with the elements of nature. It sure will absorb some of the spike rubbish coming in, but not all of it. Personnally I prefer to unplug all electronic gadgets in my house when the smiling Catherine Laborde of the meteo warns me for risque d'orages faibles ou parfois violents. I'm very obedient. Even with a professional lightning fast parafoudre system installed. Promotelec: Les solutions face à la foudre. Fusadee: Fast rise and response times. Last but not least: the earth connection. Re: Surge protectors: touching wood? To be honest all the techy stuff has sailed unhindered over my head, but I will certainly take the advice to heart and remember to unplug my beloved in inclement weather, thanks.